Personalized medicine is becoming the hallmark of care in oncology, but its use is also increasing in other therapeutic areas including inflammation, respiratory, infectious diseases and central nervous system disorders, as scientific understanding of these diseases advances. The expansion of companion diagnostics beyond oncology has impacts on dealmaking, clinical practice and the R&D pipeline. Companion diagnostics are critical tools for the implementation of personalized medicine by enabling the identification of particular biomarkers that indicate the patients most likely to benefit from specific therapies or combinations of therapies. Takeda and AstraZeneca are investigating biomarkers with their late-stage assets for Alzheimer’s disease and asthma, respectively, indicating that companion diagnostics have the potential to reach beyond specialty therapeutic and rare disease areas in the near term. Multi-biomarker assays are an area of interest among pharmaceutical and diagnostics developers, and clinicians are interested in using them to inform their treatment decisions. InVentiv Health's survey of practicing oncologists in the US finds that 90% believe multi-biomarker diagnostics will be accepted as the standard of care within the next three to five years. Expanding personalized medicine beyond the oncology sphere offers significant upside, including targeted use in patients most likely to benefit as well as adding value to the health care system. However, there are unique development and commercialization challenges associated with pairing a therapy with a companion diagnostic. Proper preparation and expertise is required to avoid potential pitfalls, such as partnership challenges and education requirements for expanded audiences at launch. Additional considerations for a successful drug-companion diagnostic launch include demonstrating clear value to both providers and payers, both of whom are critical drivers of uptake. Advancing personalized medicine is becoming the goal of many drug manufacturers, as is evident by the number of such therapies in clinical development. According to the FDA, more than 20% of new molecular entities (NME) approved by the FDA in the last three years – and 27% of the 22 NME approvals in 2016 alone – can be classified as a personalized medicine, not including previously approved therapies. Half of the personalized medicines approved in 2016 (three) were indicated in oncology. The others had indications for either infectious or rare disease. This trend signifies a major shift in the way drug companies are organizing and thinking about commercializing pipeline assets – likely as a way to differentiate therapies in crowded markets (e.g., oncology, hepatitis C) or command a higher price point due to their ability to selectively target appropriate patient populations most likely to benefit. Companion diagnostics that can help identify the right patient for the right drug at the right time are playing a major role in this trend. An analysis of recent deals in diagnostics shows that companion diagnostics deals, as a percentage of all diagnostics partnerships (including licensing agreements, asset purchases, joint ventures, etc. ), have held relatively steady over the past five years, despite an overall decrease in the number of diagnostics deals. For example, in January 2016, NanoString Technologies Inc., Medivation Inc. and Astellas Pharma Inc. announced a partnership to develop and commercialize a triple-negative breast cancer (TNBC) companion diagnostic for enzalutamide based on a cancer gene expression signature algorithm from NanoString, in a partnership agreement with a disclosed value of $22 million. [See Deal]NanoString will modify its existing Prosigna Breast Cancer Assay, a multiplexed biomarker test, as a companion diagnostic for enzalutamide in TNBC, a form of breast cancer with relatively high unmet need. Beyond oncology, NuSirt Biopharma and OWL Metabolomics forged a partnership to develop a blood-based companion diagnostic for NuSirt’s NS-0200, currently in Phase II trials for non-alcoholic fatty liver disease (NAFLD) and non-alcoholic steatohepatitis (NASH), an increasing cause of liver transplantation. OWL Metabolomics’ approach to development of this companion diagnostic is to analyze a patient’s lipidomic signature over certain time intervals to measure specific markers of histopathological change in the liver. Currently, liver biopsy is the gold standard in the diagnosis of NASH; OWL’s technology will utilize minimal blood draws (>0.5 ml), offering a significant benefit over surgery and its related potential complications. Development of NASH therapies is expected to address a major unmet need in a disease area with no approved therapies. 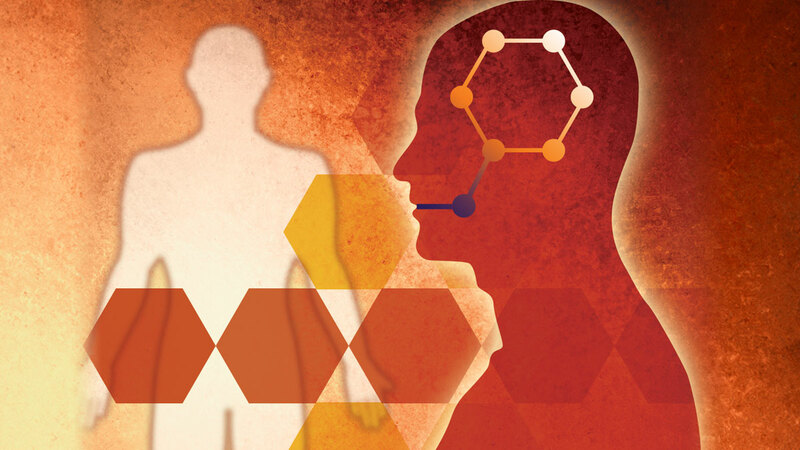 Driven by a crowded pipeline and historically low success in NASH clinical trials, these companies are seeking to differentiate therapies and improve odds of trial success to ultimately evolve a new standard of personalized care. As companion diagnostics become more common, the traditional paradigm of “one biomarker, one disease” (such as treating an anaplastic lymphoma kinase [ALK] fusion in non-squamous cell lung cancer ([NSCLC] with an ALK inhibitor) is expected to evolve to “multiple biomarkers, one disease” or “one biomarker, multiple diseases.” For example, the National Cancer Institute’s Molecular Analysis for Therapy Choice (NCI-MATCH) trial is exploring this with a 24-arm study exploring the potential for treating cancer patients with currently available targeted therapies based on the molecular profiles of their tumors, regardless of a product’s specific indication (e.g., evaluating crizotinib in ALK-mutated breast cancer). According to William Grady, MD, of the Fred Hutchinson Cancer Research Center and director of translational research at the University of WashingtonMedical School Gastroenterology Division, “The hope is that we’ll be able to better use targeted therapies by directing them to the molecular target in the cancer rather than by directing their use based on the tissue of origin of the cancer. However, what the NCI-MATCH trials are showing is that in only about 10% of the cases where the cancers have the predicted targets that should cause the cancer to be sensitive to the therapy are we seeing a clinical effect; in 90% of the cases that have the appropriate targets, the cancers are turning out to not be responsive.” He says more work is needed to better understand cellular and molecular pathways in cancer, but there is a high likelihood that a combination treatment approach with multiple targeted therapies will be able to attack the dynamic cellular features that change with time in cancer cells. Multi-biomarker assays, similar to Foundation Medicine Inc.'s FoundationOne and next-generation sequencing panels, may help to fill the void in current understanding of molecular targets. Grady continues: “What we’re discovering with functional assays is that some of the targets are completely unexpected, which means new possibilities for using other platforms to predict these targets. These assays will be another way forward” toward understanding genomic and molecular characteristics of disease through retrospective analyses to match potential drug-molecular target pairs. 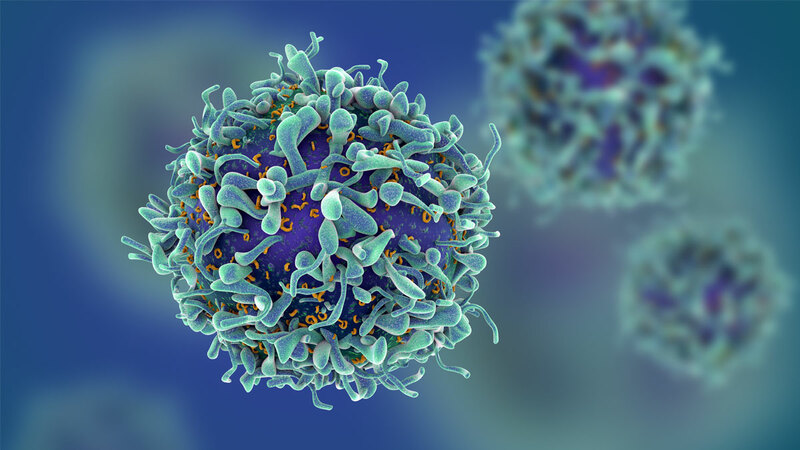 For example, Ignyta Inc.’s STARTRK-2 trial is incorporating powerful technologies, such as next-generation sequencing and proprietary algorithm-based biomarker panels, to identify and characterize genetic or molecular variation (TrkA, TrkB, TrkC, ROS1 and ALK) in cancer patients in combination with an investigational therapeutic, entrectinib. Ignyta’s unique business model, in which it is developing both the drug and the diagnostic in-house, is enabling the rapid exploration of molecular biomarkers implicated in pan-tumor settings (i.e., NSCLC, colorectal cancer, salivary gland cancer and astrocytoma) in ways that may foreshadow the future of biomarker testing and companion diagnostics development. inVentiv Health Consulting conducted a survey of 85 physicians (oncologists, n = 30; and non-oncologists, n = 55) in February 2017 to explore the views of physicians regarding the role of biomarkers and companion diagnostics in clinical practice. While oncologists reported high rates of familiarity with next-generation sequencing applications, the same was also true for non-oncologists. Among the 55 non-oncologists surveyed (i.e., rheumatologists, pulmonologists, neurologists and PCPs), only 9% reported low or very low familiarity with next-generation sequencing. 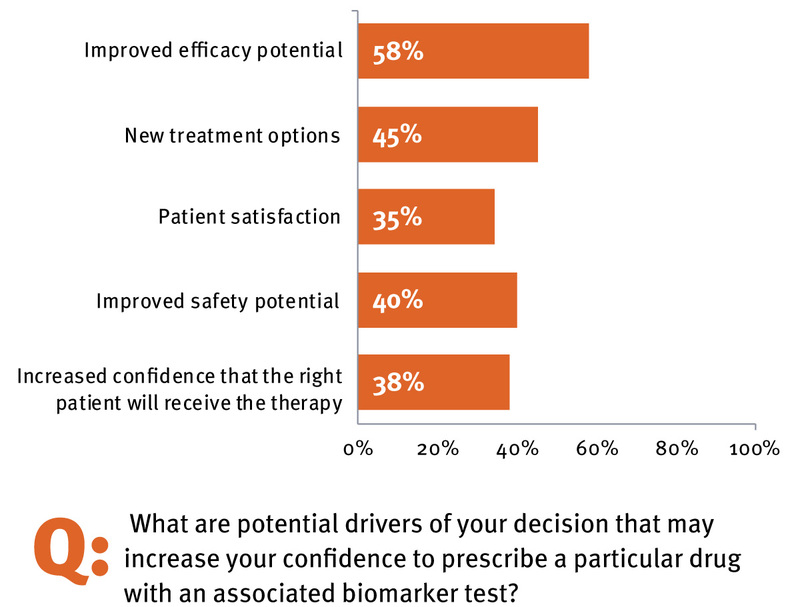 Non-oncology physicians also anticipated using personalized medicine approaches in regular practice, with 79% expressing high or very high likelihood that they will be using biomarker assays in the future if available. Indeed, well-studied therapeutic areas with numerous treatment choices in inflammatory disease (e.g., rheumatoid arthritis, irritable bowel disease) and infectious diseases are likely to be fruitful areas for companion diagnostics development in the near future. This is in addition to those therapeutic areas that already have the attention of biopharmaceutical companies (i.e., Alzheimer’s disease and NASH) due to the absence of approved therapies. 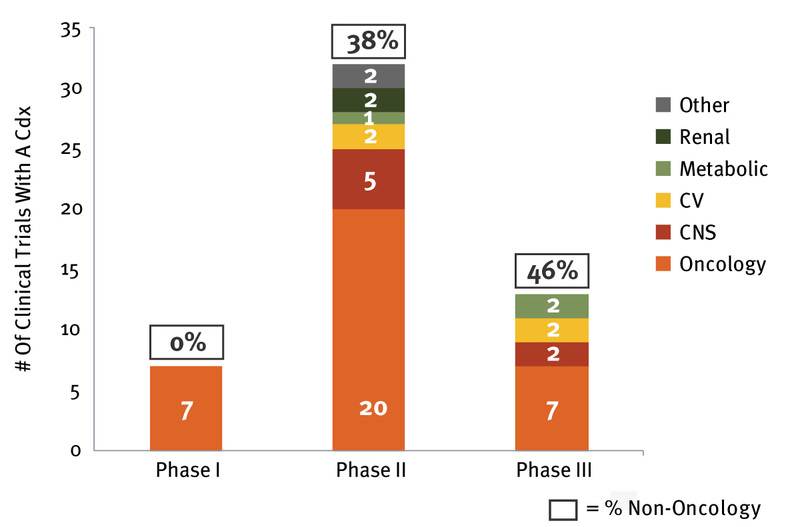 Analysis of the current companion diagnostics development pipeline shows that almost half of therapies currently in Phase III are associated with a biomarker diagnostic intended for use outside of oncology. (See Exhibit 3.) For example, Takeda Pharmaceutical Co. Ltd.’s AD-4833, currently in Phase III for Alzheimer’s disease, is leveraging a growing practice from oncology – that is, testing for multiple biomarkers using a risk assignment algorithm, similar to Prosigna or Genomic Health Inc.’s Oncotype Dx,which can predict the risk of breast and colon cancer recurrence using multiple genes. These types of assays have found a valuable niche among oncologists due to their ability to effectively help inform and guide treatment decisions for cancer patients, driven by inclusion in National Comprehensive Cancer Network (NCCN) guidelines. In addition to broad physician uptake, payers have supported the use of these assays through ensuring coverage in most commercial plans. The goal of Takeda’s trial is to evaluate the safety and efficacy of AD-4833 in delaying the onset of mild cognitive impairment due to Alzheimer’s disease and to validate a risk-based biomarker algorithm for determining this, developed in conjunction with pharmacogenomics company Zinfandel Pharmaceuticals Inc. The assay is evaluating three factors: APOE, TOMM40 genotypes and age to produce a risk score for developing early onset Alzheimer’s disease. The disease is an increasing focus for this type of effort due to the large and growing patient population as well as efforts to better understand the underlying pathophysiology that leads to disease progression. Timing: When should we partner? How should we coordinate and manage the alliance? Capabilities: What capabilities should the ideal partner have? Do they have a track record of experience? Scale: Does the partner have financial stability/access to capital and have the ability to scale at launch? It is also important to keep in mind that incentives for the drug developer and diagnostics partner are very different. Often the primary benefit will go to the drug developer – that is, shortened time to approval and reduced development costs, greater revenues, differentiation as a personalized medicine, etc. Thus, therapeutics companies must carefully consider the investments they may need to make in biomarker strategy and partnership structure. With early planning and execution, the benefits of partnering with the right diagnostics developer can be tremendous, starting with the opportunity to tailor the drug development program and clinical trial design much earlier in the process. Choosing a diagnostics partner too late into clinical development runs the risk that the companion diagnostic assay won’t be developed, validated, and approved by the time of drug approval. This can lead to potential confusion and inefficiencies during development and launch planning and, most importantly, poor uptake and failure to realize the full commercial potential of the therapeutic. Companion diagnostic development and optimization should be completed prior to pivotal trial initiation to increase the likelihood of simultaneous launch. 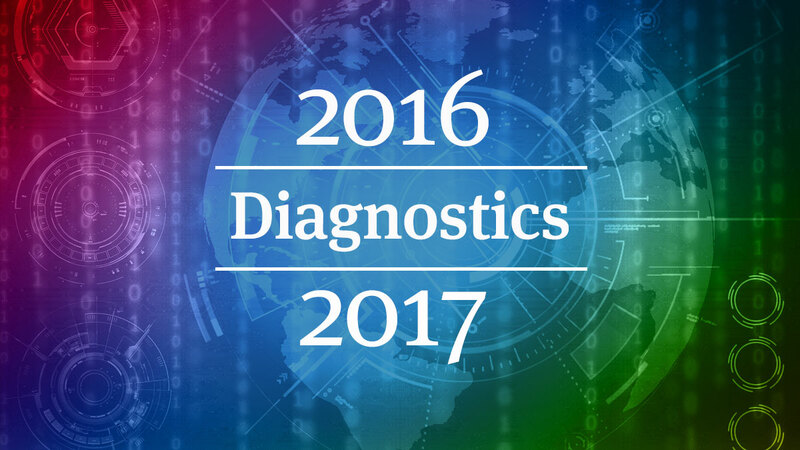 Diagnostics companies may have different expectations and it is important for both partners to gain alignment. With or without a partner, making an early decision to utilize a biomarker-based strategy may help reduce exposure to the risk of clinical trial failure and subsequently improve return on investment. In the largest study of clinical drug development success rates to date (over 9,500 phase transitions), a BIO Industry Analysis using data from Informa's Pharma Intelligence's Biomedtracker found that between 2006 and 2015, therapies that utilized biomarkers as inclusion or exclusion criteria had a three-fold higher likelihood of approval (25.9% from Phase I to approval) compared with drugs that do not have an associated selection biomarker (8.4%). At launch, the adoption of personalized medicine is heavily dependent on stakeholder education, and detailed launch planning is key to preparing the market. Generally, launches with companion diagnostics include more customer stakeholders than the traditional drug launch. In addition to the traditional stakeholders (e.g., prescribers, nurses and payers, etc. ), education of appropriate lab personal is also required to ensure awareness of the companion diagnostic and help guarantee uptake of the novel therapy. This may require development of additional marketing materials or even coordination of sales teams to incorporate a laboratory call point. Nothing is more important to a successful companion diagnostics partnership than excellent communication from start to finish – a key factor in which is trust. Trust can be built or frayed around such issues as intellectual property sharing, the timing and strategy surrounding market development and educational initiatives, progress updates and the like. Even differences in corporate culture can make it difficult for partners to communicate with each other effectively. To mitigate these risks, it is vital to establish a regulatory communication plan at the outset. Partners should communicate with each other before and after each FDA interaction. Both drug and companion diagnostics partners should consider and align on marketing strategies for pathology labs that will be involved in terms of investment, messaging, education, training and marketing materials. During the launch window, communication between the partners needs to continue to ensure optimal uptake. Personalized medicine is anticipated to continue changing treatment paradigms and evolve beyond oncology with the aid of companion diagnostics. A successful drug-companion diagnostic launch may be complicated and multi-faceted, yet the benefits greatly outweigh the challenges. There are few other strategies that allow drug developers to reduce development time lines, increase the likelihood of R&D success, improve outcomes for patients and deliver greater value. The challenges associated with the development and commercialization of personalized medicine can be minimized with proper and careful preparation: from development of biomarker strategy, to diagnostics partner selection, to engaging expanded stakeholder audiences – physicians, pathology labs, payers, patients, advocacy groups – at launch to ensure a therapy’s success. Ultimately, companion diagnostics and personalized medicine have enormous potential to deliver significant value to patients and the health care system, benefiting all stakeholders. Jessica B. Lee, PhD (jessica.lee@inventivhealth.com) is a director, Commercial Strategy and Planning, for inVentiv Health Consulting in San Francisco; Ravi Patel (ravi.patel@inventivhealth.com) is an engagement manager, Commercial Strategy and Planning, for inVentiv Health Consulting in New York; David Ruch (david.ruch@inventivhealth.com) and Katya Magonova (katya.magonova@inventivhealth.com) are senior consultants in the Commercial Strategy and Planning practice for inVentiv Health Consulting, based in Boston and New York, respectively. Which Path Forward For Foundation Medicine?